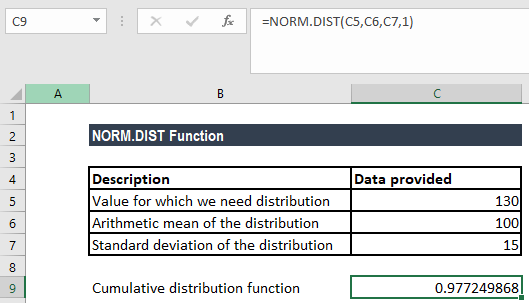 What is the NORM.DIST Function? 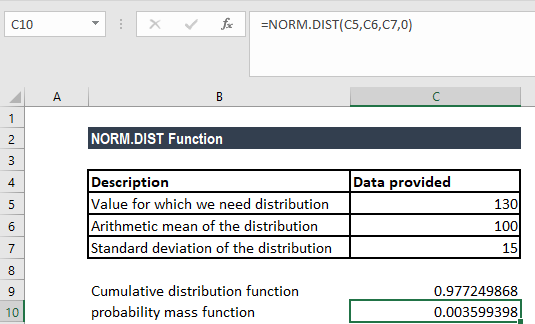 The NORM.DIST function is categorized under Statistical functionsFunctionsList of the most important Excel functions for financial analysts. This cheat sheet covers 100s of functions that are critical to know as an Excel analyst. It will calculate the probability that variable x falls below or at a specified value. That is, it will calculate the normal probability density function or the cumulative normal distribution function for a given set of parameters. To understand what normal distribution is, let us consider an example. Suppose we take an average 30 minutes to complete a task, with a standard deviation of 5 minutes. Assuming a normal distribution for the time it takes to complete the work, we can calculate the percentage of time for which the time would be between 25 minutes and 35 minutes. As a financial analystCertified Financial AnalystCFI Financial Modeling & Valuation Analyst program is your path to become a certified financial analyst. With 12 required courses on topics ranging from accounting and finance fundamentals to financial modeling, valuation and advanced Excel skills, the CFI financial analyst certification will help, the NORM.DIST function is useful in stock market analysis. In investing, we need to balance between risk and return and aim for the highest possible return. Normal distribution helps quantifies the two aspects, which is risk and return, by the mean for returns and standard deviation for risk. Cumulative (required argument) – It is a logical value. It specifies the type of distribution to be used: TRUE (Cumulative Normal Distribution Function) or FALSE (Normal Probability Density Function). We can use 1 for TRUE and 0 for FALSE while entering the formula. 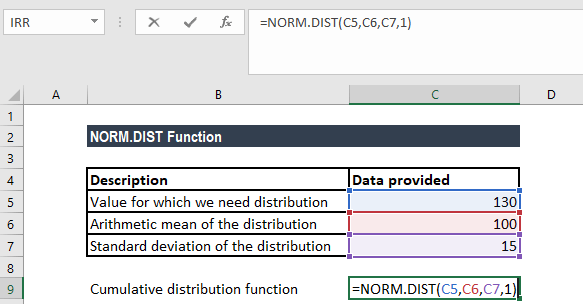 How to use the NORM.DIST Function in Excel? Suppose we know a friend who claims that his IQ is above 130. We know that the population mean IQ is 100 and the population standard deviation for IQ is 15. Based on this data, we can calculate the probability of that our friend showing an IQ above 130. The function gave us a result of 0.977, which means that there is a 2% probability of our friend showing an IQ of 130. It indicates roughly 0.35% of the population shows an IQ of 130. Here, Excel estimated the probability by using a small range for the single value. NORM.DIST replaces the NORMDIST function. 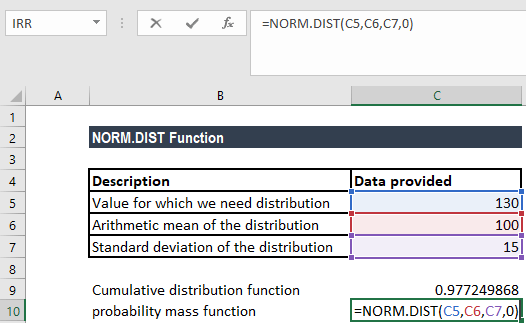 The NORM.DIST() function refers to any normal distribution, whereas the NORMSDIST() compatibility function and the NORM.S.DIST() consistency function refers specifically to the unit normal distribution. #VALUE! error – Occurs when any of the given arguments is non-numeric or is a non-logical value.